Menulog… if it feels like they’re everywhere at the moment it’s for a reason. Their digital marketing is excellent, they’re doing a lot of things right, as this review is about to cover in detail. After announcing they had been acquired by British company Just Eat for an eye-watering $855 million in May 2015 the pressure was on. Their biggest competitor Delivery Hero took the time to denounce the acquisition as “crazy” and “insane”. The acquisition was one of the biggest stories in Australian tech in 2015. The general consensus at the time was the multiple paid was far too high. However, earlier this year Menulog execs announced that their acquisition had started to deliver a return on the hefty price tag, with key metrics like orders growing 81% year on year. With the home delivery market in Australia worth $16.4 billion a year, and in an industry where it doesn’t pay to be the second biggest player, the Just Eat team went all in with the purchase of Menulog, and it could be paying off. With all those dollars behind them, let’s take a look at how their digital marketing stacks up. Let’s start with the way the site looks, and functions. It’s geared towards searching quickly and easily for food – as you’d expect. The tagline “what do you feel like” is fantastic. The supporting content below the hero banner calls out some key points and emphasises how easy it is to get food delivered to your door. This is what I’d want to see here. The user is quickly orientated with the key functionality of the site, which is the search box. All good stuff so far! The Menulog SEO strategy is very well executed. The site would be driving significant traffic through the Google organic search results. I don’t have access to their Analytics to confirm this, but we do have tools that track website rankings over time and estimate the traffic. This shows steady growth in traffic over 2014 and 2015. Then, there was a spike around January 2016 and over the rest of the year. Let’s look at how they’ve achieved this. The home page is the most powerful page on the site, as that’s where most of the links and authority signals are naturally accumulated. This is the case for any site on the internet. By linking from the homepage to the location, cuisine, and meal type pages, Menulog are indicating to Google that these pages are also important and should benefit from the strength of the home page. It goes much further than this, though. There are hundreds of these pages, in this case, one for every suburb in Sydney. 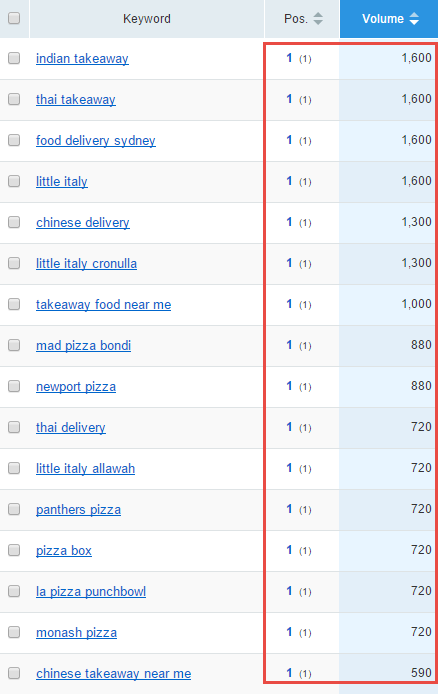 The page is well optimised to rank for search terms related to food delivery in Balmain. And ranking for specific suburb based food delivery terms would be extremely valuable to Menulog. If somebody is entering a specific location for food delivery then chances are they are really close to having their wallet out to order food then and there. Let’s take a look a how the page is optimised. Google draws on the title tag when deciding how relevant your page is for a search term, so by optimising it for the two delivery type terms as well as the Suburb, Menulog have given themselves the best chance of appearing for all sorts of different searches. Secondly, the meta description tag is also well optimised to include the same keywords. You can see Google has bolded the words “food delivery” and “Balmain” in the meta description here, as hose are the terms I searched for. Most SEOs will say it’s not necessary to include keywords in the meta description, but because Google bolds them like this, and it reinforces what the user has searched for I am a fan of doing so. There’s no doubt this has an impact on click through rate. Most SEOs will say it’s not necessary to include keywords in the meta description, but because Google bolds them like this, and it reinforces what the user has searched for I am a fan of doing so. There’s no doubt this has an impact on click through rate. At the top of the page, there is a heading which more or less mirrors what is being targeted in the title tag. The issue here is it’s been marked up as an H2 tag. This heading here is a prime candidate to be marked up as an H1 tag. The H1 tag should only be used once per page and should include the most important keywords for the site. H2 tags can then be used for as many supporting headings as you wish. 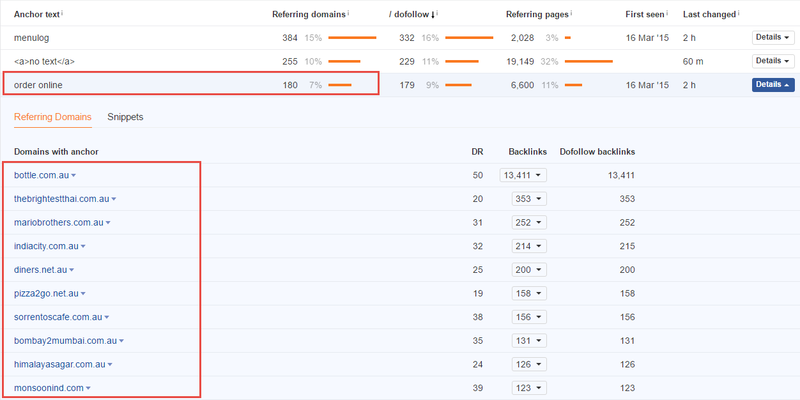 This is important because the H1 tag is one of the areas Google looks at when assessing how to rank a site. Menulog aren’t doing much wrong, but they are missing a trick here. 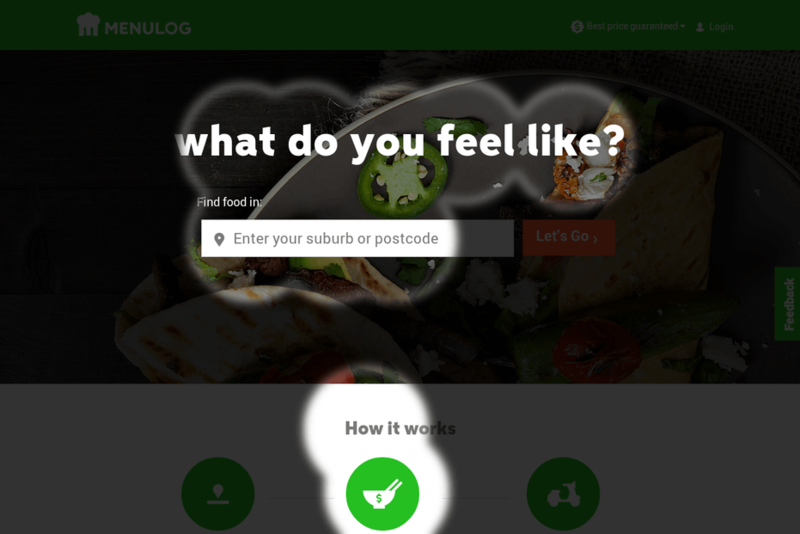 This text is optimised for the same takeaway and food delivery terms for the suburb that we covered in the title tag and heading area. The text provides context, through listing the cuisine types and specific keywords, and helps Google work out that this page is about food delivery in that suburb. This approach is replicated for all of the other major cities and regions, with every single suburb in every location having one of these pages. Once again, click any of those cities and regions and there is a huge list of suburb based pages, this time targeting Pizza terms. The same goes for individual dishes. That’s millions of pages that are all hyper-targeted towards bottom of the funnel search terms like “butter chicken food delivery in Balmain”. It’s a beautiful thing if you’re an SEO nerd. 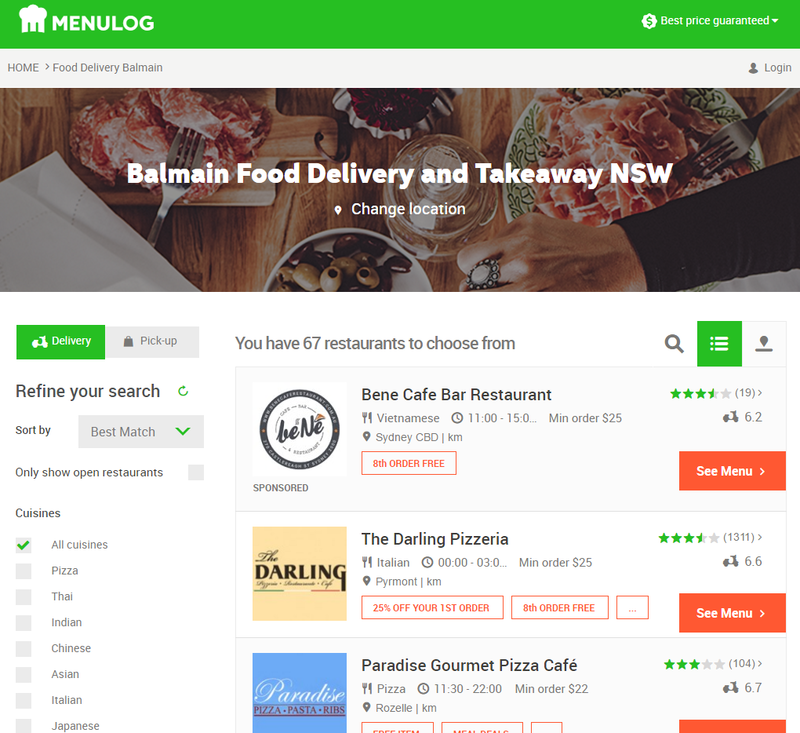 But also if you’re running a business that could benefit from a similar strategy – just look to Menulog for inspiration. The above is just a small portion of Menulog’s “onsite SEO” strategy. Another large part of SEO is the “offsite” side of things. This essentially just means how many other sites link to your site. Generally, the more links you have the better your site will go in terms of organic traffic. It’s a little more complicated than just blasting loads of links though. Relevance and quality also play their part. Menulog have all of that covered. Those domain names there are some of the most well known, strongest and oldest domains around. 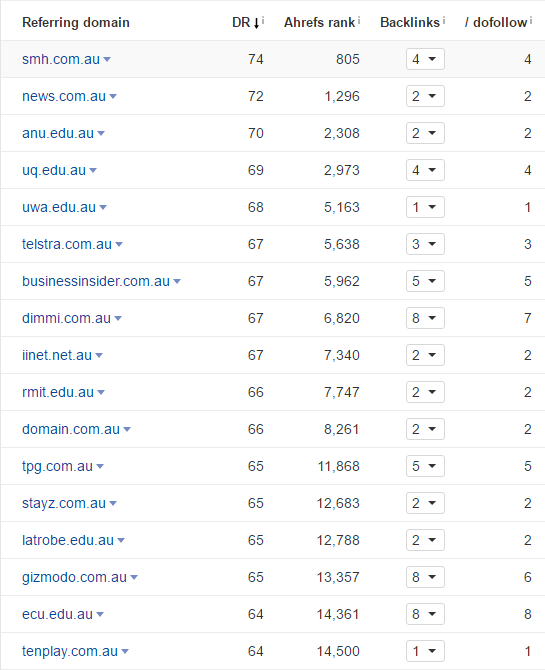 Big name domains like The Sydney Morning Herald and Telstra carry a lot of weight, so a link from them is very valuable. However, Menulog also has the “relevance” side of things nailed as well, with a tonne of links from restaurants themselves. This screenshot shows that the term “order online” is one of the terms sites use most when linking to Menulog. 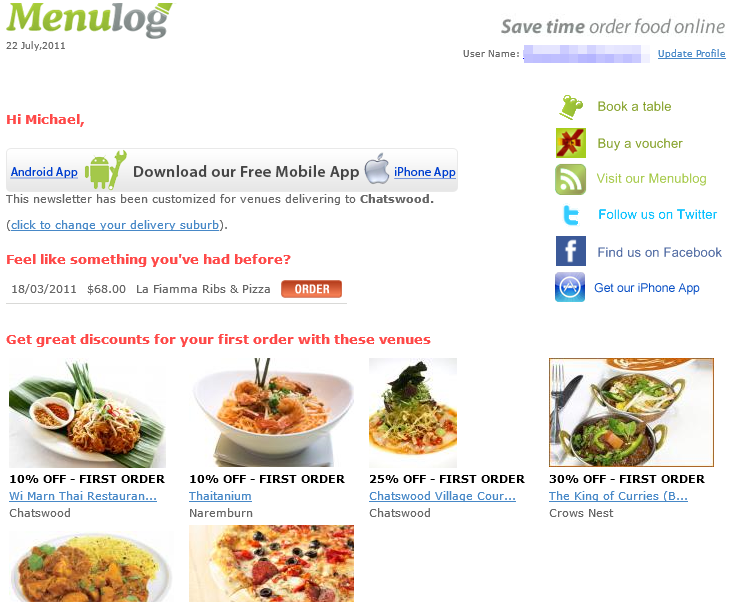 Restaurants are naturally linking to their order page on Menulog from their own sites. And a tonne of others linking with images and all sorts of different terms. 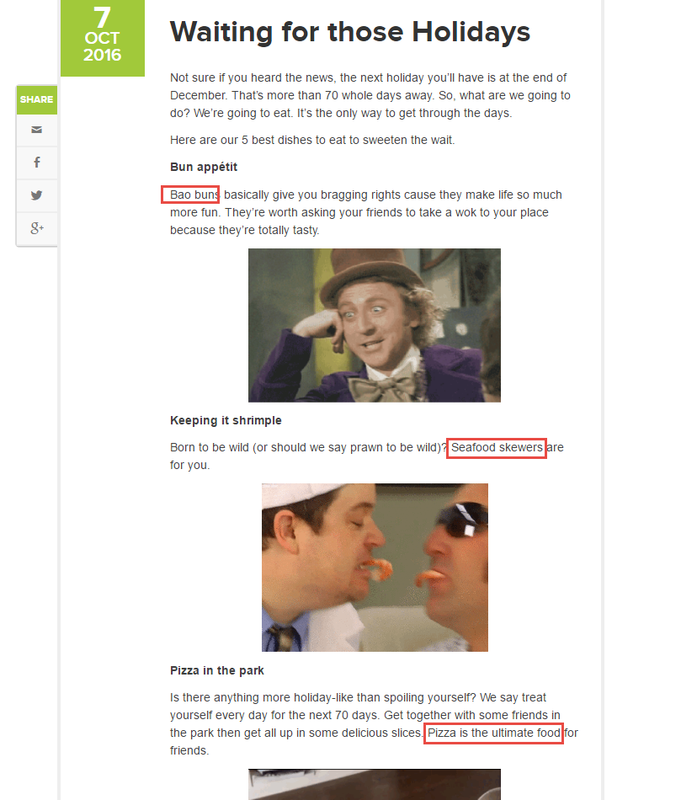 Google is lapping this stuff up, as the link is on a relevant site (food related) and on an Australian domain. What can you learn from this for your business? First of all, if you work with partners then perhaps they can link back to you. If you’re an e-commerce store perhaps the manufacturers of your products will link to you. It’s worth asking. Second of all, you absolutely need a mix of authority links from strong domains as well as relevant links from sites in your industry. I’ve been a Menulog user for about 5 years now, so I’ve been able to go through their Email marketing over that time period. These were sent at random intervals. They were very transactional, with a focus on pushing the recipient into placing an order. What do their emails look like these days? They now roll these emails out every Friday. This makes sense, as it no doubt aligns with their busiest time of week which would be Fridays and Saturdays. The emails also are more conversational in nature, and either funnel you to the home page if you click start your order or a blog post if you click read more. The blog section is a little underwhelming if I am honest. The articles are quite generic (although they are attempting a BuzzFeed style) and throughout the posts, food is mentioned, however, not linked to the actual order pages. I think there are a couple of other areas they could look to improve on when it comes to email. Namely, sending cart abandonment emails and using offers to build their email list. Cart abandonment emails are sent to a user if they have started the checkout process but left half way through. If they have already handed over their email when checking out, or are a logged in user and you have their email, then it doesn’t hurt to send an email gently reminding them to check out. This is big business in e-commerce as I covered in this article, and it is worth testing on Menulog. I attempted to check out while logged in, and abandoned it, yet received no email. I’d recommend setting up cart abandonment emails to be sent 15 minutes after abandonment politely reminding the user their meal could be on the way. These emails would need to be sent quickly, as an hour or more late and the chance of an order going through is non-existent. The second area of improvement for Menulog on the email side of things is list building. I don’t have access to their analytics, but I highly doubt every single new visitor to the site turns into a customer there and then. As such, Menulog would often be paying for that visitor through AdWords, SEO efforts or offline marketing, getting them to make it to the site, but then losing the relationship once they leave the site. I noticed while using the site that there were no pop-ups or offers designed to encourage people to submit their email address. I believe this is a missed opportunity, as once Menulog have that email address they can market to the user via email and turn them into a lifelong customer. I’d recommend testing a pop-up that displays when users go to exit one of the deeper pages of the site. 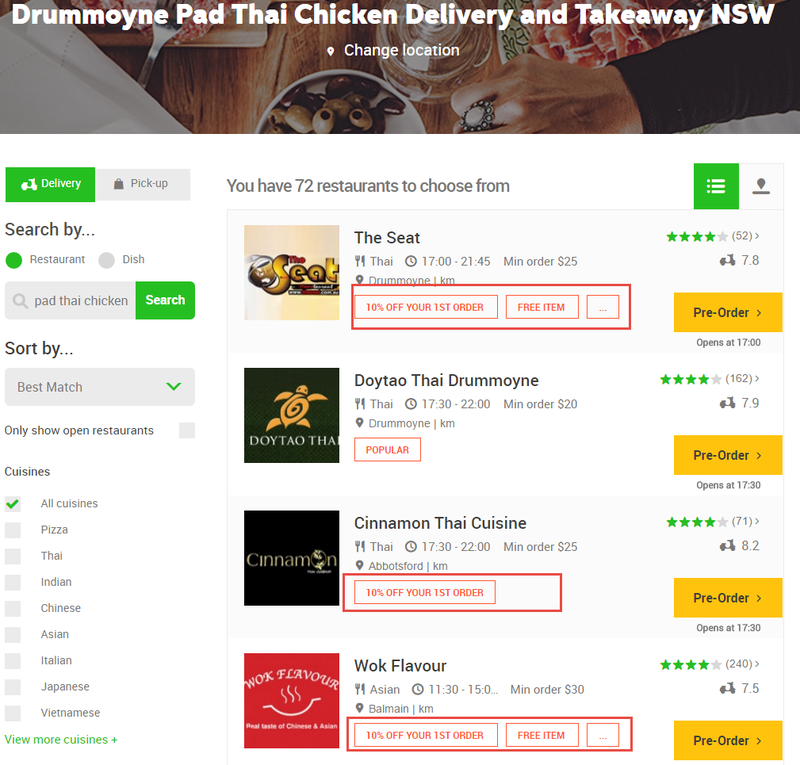 For example, consider the “Pad Thai Chicken” food type page for Drummoyne. If a user lands on this page it’s highly likely they want Pad Thai from a restaurant that can deliver to Drummoyne. 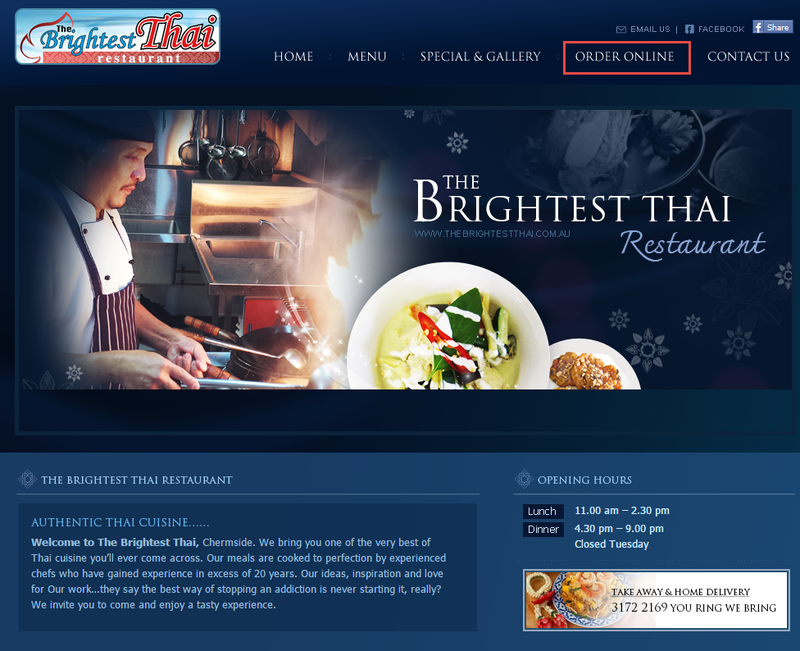 If they then go to leave the page without ordering, a pop-up could display that prompts them to enter their email address and receive a list of all restaurants with special deals on Pad Thai for that location. Having a really targeted offer like that shown could encourage them to hand over their email address. 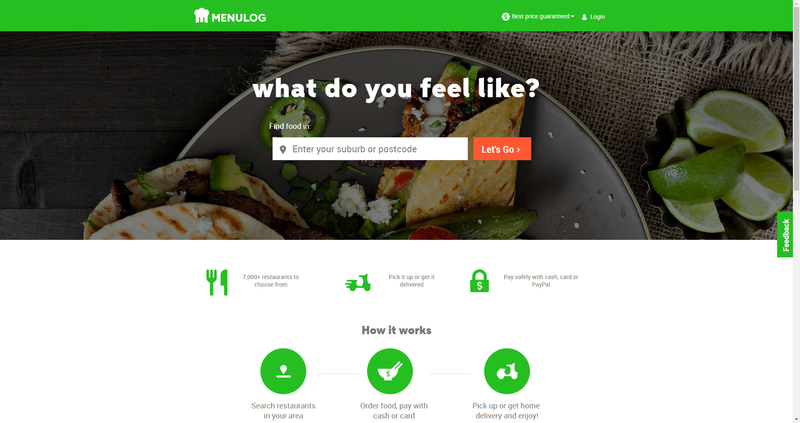 When you consider the scale of the Menulog site and the sheer volume of pages for cuisine and food types combined with suburbs, I would expect Menulog could drive significantly more email subscribers on the back of this tactic. These are subscribers that can be marketed to over and over again, without the acquisition costs of AdWords or other forms of digital marketing. As covered in this post, Menulog are doing a lot right with their digital marketing, particularly when it comes to the SEO side of things. 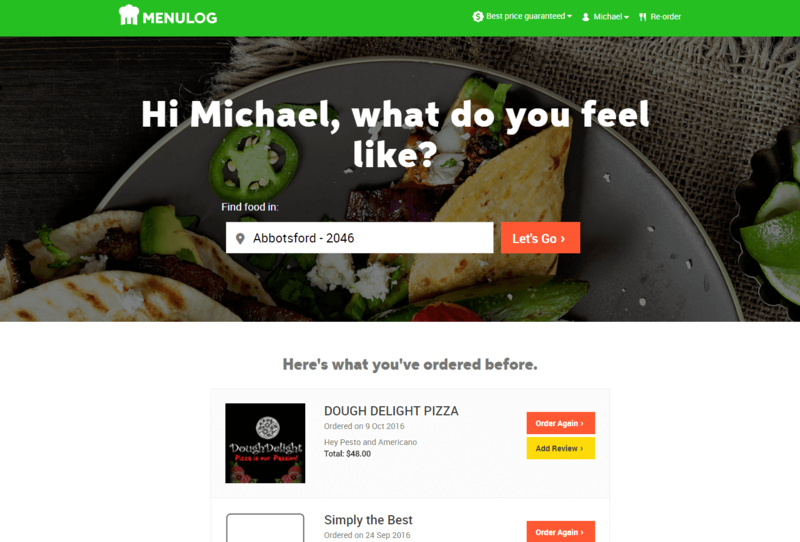 It quite often pays to take a look at what established sites like Menulog are doing with their digital marketing for inspiration on your own site. If you’re interested in an audit of your own digital marketing or have any questions or comments please get in touch.